The passive magnetic pickups on a typical electric guitar produce a weak signal that is not compatible with the line-level input of a mixing console. A direct box—also referred to as a “DI,” which is short for “direct input” or “direct inject”—is an indispensable audio tool equally at home in the studio and on stage. There are a number of different kinds of DIs, but all have the same basic job: to convert the relatively weak, high impedance signal from instruments with magnetic pickups (such as a guitar or bass) to a low impedance, balanced mic-level input signal compatible with a mixing console. 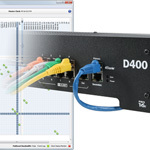 To get good results with a DI, it’s important to look at what your input signal is and what you’re connecting to. There’s a second issue that makes the signal from a pickup on an instrument incompatible with most line level inputs: impedance mismatch. A typical passive guitar pickup has a high impedance (resistance to the electrical signal flow) while a typical line-level input on a mixing console has a low impedance. Plugging your instrument directly into a console’s line-level input jack usually results in a low-level, wimpy signal. That’s where the direct box comes in. The direct box is designed to translate between the two worlds; it converts the instrument-level signal into something the console can use easily—a mic-level signal. As a bonus, the direct box changes the source signal from unbalanced to balanced, allowing longer cable runs that are much less prone to noise and RF interference. The most common I/O connections on a DI box are unbalanced ¼-inch TS jacks for the input and a male XLR for the output; many direct box designs also provide a thru jack that allows the source signal to be connected to another device, usually an amplifier. In this picture the output from a guitar is connected to the instrument-level input on a direct box. The Thru connection, marked ‘amp’ on this model, allows the guitar signal to be connected to a vintage amp while the raw guitar signal is simultaneously sent to a mixing console or recording device via the XLR mic output on the DI box’s rear panel. Direct boxes come in two basic types—passive and active. A passive DI uses an internal transformer and requires no power source for it to work. Just plug the instrument into the input of the direct box and a mic cable into the output; the mic cable then connects to the mixer’s XLR mic preamp inputs. An active direct box, as its name implies, has circuitry inside that requires a power source. That power can come from an internal battery or from a phantom power source (typically 48V) provided by the mixing console that is delivered over the same XLR mic cable used to connect the DI to the mic input. Which type of direct box you choose is a matter of personal preference, but as you’d expect, everything that you put in a signal chain has some impact on the resulting sound. So how do you set up a direct box? Let’s look at a few common scenarios. Guitar players love their amps, and it’s really hard for them to get past having an amp on stage. Getting that tone into the PA has largely been a job for a mic—just shove your favorite dynamic mic up against the speaker grille and go. But consider some of the specialty direct boxes out there designed specifically for use with electric guitar. There are designs from companies like Radial, ADA, and Hughes & Ketner that are intended to capture the signal coming from the amp’s output before it goes to its speaker, eliminating the need to mic the amp. This not only simplifies your audio setup, but it also means you can use smaller amps on stage and keep stage volume down. That helps mix things more cleanly at front of house and also cleans up monitoring on stage. In the recording studio, a direct box is a good solution for guitars when you want to get the squeaky clean sound that a direct box offers, but note that you may also want to employ an amplifier to get those other tones since the direct sound of a guitar is much brighter than a guitar player is used to hearing. Recording a clean copy of the guitar signal also makes processing the guitar later—through either a guitar amp (also referred to as “re-amping”) or through a modeled guitar amp DSP simulator within your DAW recording software—a breeze. The built-in pickup system on this acoustic guitar allows the performer to blend two different pickup sources (an under-saddle piezo and a mic) that are sent to a single output jack which gets connected to a direct box and the PA. Using an acoustic instrument such as a guitar or mandolin on stage will almost always require some sort of reinforcement to get the sound level of the instrument up high enough to be able to compete with the other instruments on stage. To get the most natural sound, you’ll almost always use a connection direct to the PA system rather than to a guitar amp; an amp designed for electric guitars just doesn’t have the frequency response that allows the true tone of an acoustic instrument to shine through uncolored. 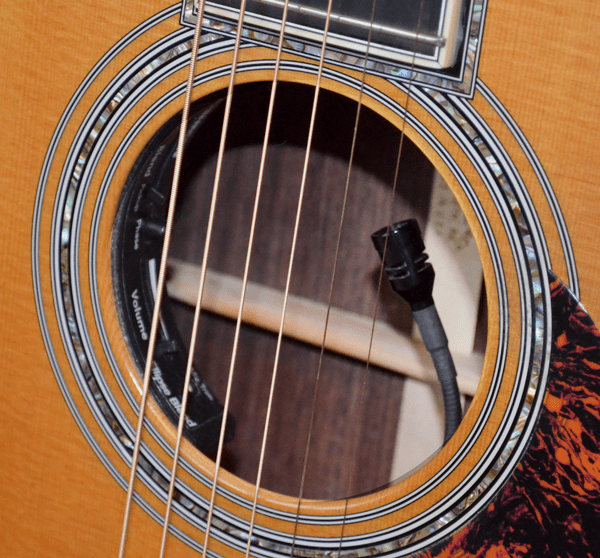 A pickup system installed on an acoustic guitar, for instance, can include one or more pickup devices (magnetic, piezo, or microphone) that allow the instrument to be connected to a direct box and then to the PA system. There are also specialty direct boxes designed specifically for the piezo pickups commonly used in acoustic instrument pickups. A direct box is a go-to way to get bass into a PA system or recording device. In the studio, a direct box has been the go-to solution for recording basses for years, especially if the bass player is performing in the control room. The super-clean signal path works well with compression and EQ from the console. At the concert level, there’s rarely a live performance where a direct box is not used on the bass. It’s a great way to capture the full fidelity of the instrument and add appropriate processing like compression and EQ while at the same time allowing the bass player to use an amp on stage for feel and monitoring. Another feature common to most direct boxes is a switch that allows the ground connection to be reversed or lifted. You’ll need this feature when connecting an instrument to both an amp and the mixing console if a ground loop between the amp and console causes hum because of differences in the electrical connections. The DI is equally at home with the output from keyboards and other electronic devices like drum machines. Bands that use in-ear monitoring may not need any amps on stage, instead relying on modeling DSP devices and/or direct boxes for the connection to the sound system. 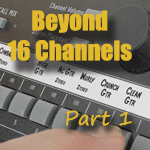 If you play a single electronic keyboard or synthesizer, a pair of direct box connections can deliver the full sound of your stereo keyboard to the PA. Just patch the left and right outputs from the keyboard into each direct box’s input. As with a guitar if you want to have an on-stage amp, connect the thru jack from the direct box to a keyboard amp. If you use multiple keyboards and have a small mixer in your rig, then patching the output of the mixer into the direct box input accomplishes the same thing. You set the blend for all the keyboards and your master keyboard mix goes to the PA system. Of course you can put a DI on each keyboard in your rig, but especially for smaller bands, that may not be the most practical solution. Stereo direct boxes as well as multi-channel solutions are available to help connect your signals to the PA.
A multi-media direct box can be used to interface a computer to a PA or recording system. Laptop computers are quite common onstage: drummers use them for loops and click tracks, keyboard players run virtual synth instruments on them, etc. 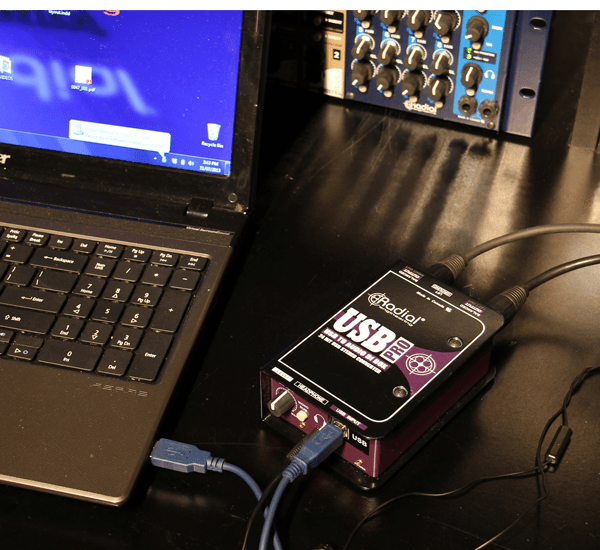 Connecting the output of a laptop to an amp or PA system is always a challenge. Fortunately there are a number of special purpose direct boxes available that are designed to interface computers and other multimedia devices. The thing to remember is that a direct box is typically used to make one source (a guitar for example) appear at the mixer’s input at microphone level. A cable adapter cannot do this. Some mixers and audio interface have input channels that are specially designed to accept an instrument level input from a guitar or bass. If you use one of those special inputs, you do not need the direct box–the console is doing the level and impedance matching for you. For your keyboard example, a direct box is the correct choice. The PA system’s XLR inputs are expecting microphones. A direct box allows your keyboard instrument to present the proper level to the console mic preamp without overloading it. If i buy a Rack mountable Direct Box, does it have to be on stage or is sending the guitar cable 300ft then connecting to the DI box ok? because i know its used to work with reducing the noise. but I’m wondering if the cable length running up to the DI box makes a difference? To get the best results, connect your instrument to the direct box with the shortest possible cable. The cable long run to the console then travels over a balanced, low-impedance mic cable which will help keep added noise at a minimum. 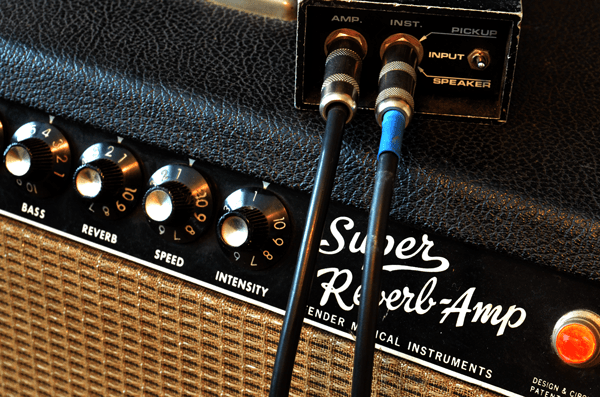 A 300-foot guitar cable will definitely affect the sound of the instrument, and you will hear the difference. 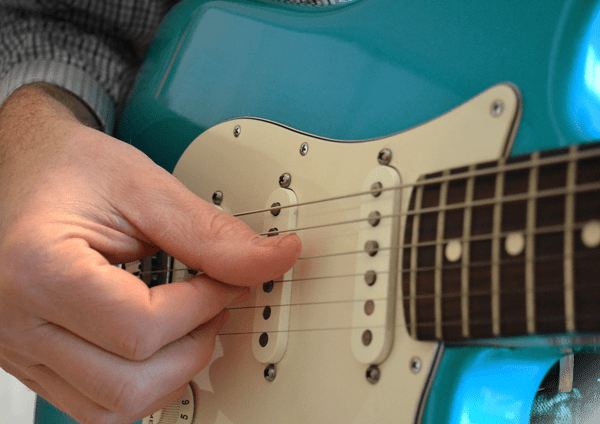 Listen to your guitar with 3-foot, 12-foot, and 25-foot (or longer) cables and compare the results. Great post! For onstage use, I’m looking to run my electric guitars through 4 Boss pedals (TU-2/RV-3/BD-2/TR-2) to a Peavey KB3 keyboard amp. To best take advantage of the pedal-introduced tone, where in the chain should I place the Radial passive DI that gets here tomorrow? : ) Thanks! A direct box placed after the effect pedals will allow the processed tone to be sent to the PA system. Instrument/Microphone Level (these two are close to the same very low voltage ). Line level (-10 Dbv and +4 dbu). Speaker Level (8 volts or greater). A DI will change various level sources into; a balanced mic level output, for the mic level XLR inputs, on the board. Pardon the stupid question, but in a live setting, does the DI only send raw guitar signal to PA? If that’s so, then how do I get all sorts of distortion tones from my amp? Using a traditional direct box, the answer would be ‘yes’; the instrument is fed to the PA before the amp. The method is frequently used with bass. To capture a more realistic guitar + effects + amp tone, look into specialty direct boxes designed to be used with guitars and amps to capture amp tone as well. 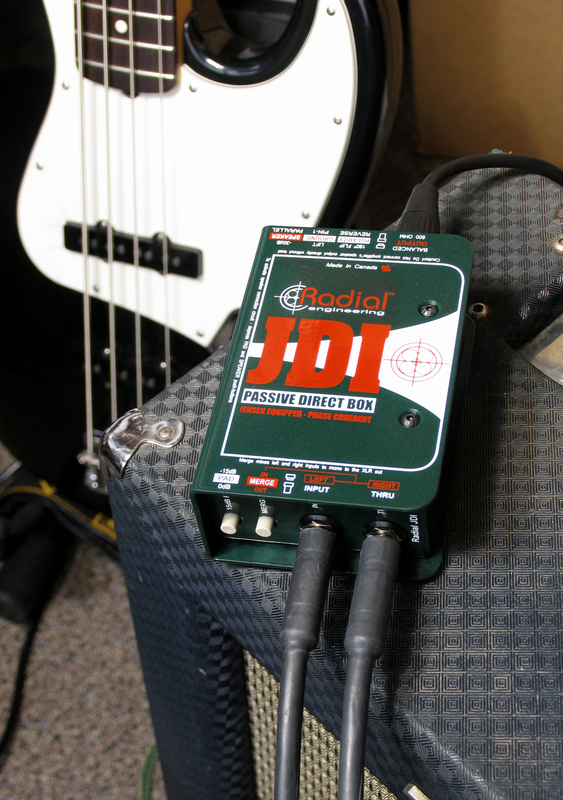 The Radial JDX 48™ Reactor™ Guitar Amp Direct Box is one such device. just want to ask you, if a bass pedal (for ex. Zoom B1Xon) can do the work of a DI Box, or you will have to buy a DI Box anyways in order to record bass straight to a console. Most stomp box effects for guitar and bass are designed to be used between the instrument and an amplifier. In that case a direct box Should be placed before or after the effects to connect the instrument to a mixing console. The placement of the direct box allows you to decide if you want to record the sound of the effect or just the dry instrument sound. Some guitar and bass effect devices do provide a line-level output. If the device specifies that its output works at line-level, then no direct box would be required. You can just plug the output of the device into the mixing console’s line input. CAUTION – THE JDX 48 IS NOT A LOAD BOX! A speaker or equivalent load must be connected to the JDX 48 ‘TO SPEAKER’ connector at all times during use. A speaker MUST be plugged into the INTERNAL SPEAKER jack when the Super–Sonic amplifier is ON or damage may occur. I’m trying to convert the line level 1/4 in. outputs from an Allen & Heath GL2400 to mic level XLR inputs on a camera. Is it possible to use DI boxes in this situation, and what would be the proper configuration? A standard direct box is intended for use with an instrument such as a guitar or bass that has a fairly low level. The line-level output of a mixing console is typically very high by comparison and will usually overload a mic-level input. You can try attenuating the signal at the console to lower it to a level that the mic input on the camera can use without distorting. You can use a transformer to lower the line-level signal to mic level (for example, the Shure A15LA Line Adapter) or a specialty direct box designed for line-level sources. maybe this is a stupid question but doesn’t it make sense to go from a guitar amp’s line out to the DI box rather than straight from the guitar? That way you get a signal that isn’t a dry guitar but rather the same signal coming out of the speakers on the amp or cab. In other words, why would you go straight from guitar to DI box then thru to the amp when you could just go from the amp to the DI box? thanks. There are no stupid questions. A direct box could certainly be placed after the preamp section of an amp as you suggest. But, that captures the amp sound in the signal chain. If that’s what the engineer wants, then it’s a good thing. If the intention is to capture the raw instrument sound without the influence of the amp, then you’d connect the instrument to the direct box first. The amp becomes the musician’s local on-stage monitor. Patching the instrument to the direct box before the amp is typical for bass. It’s also the preferred method when recording since it gives the maximum amount of flexibility later in the recording process to change the sound of the instrument. It’s also not uncommon to capture a direct channel of the raw instrument plus the sound of a mic on the amp on another channel. It’s the best of both. If the mic’ed sound is great, leave it alone. 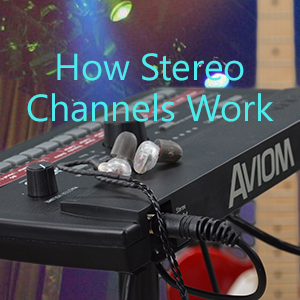 If it needs something else, add the direct channel through different processing or even through a different amp. I own a mxr m80 bass d.i. +. Of course, I use it for bass. Now, I’d like to use it to record my stratocaster. Removing the eq for bass (effect switch) makes it work like a regular d.i.. My question is If I want to record both my direct signal and my miked amp at the same time, can I use this device? Theres is an xlr direct output to connect to the board and a 1/4 jack output to connect to the amp. Would the 1/4 jack output act as a thru? Would it split my signal so I could get my miked amp track and my d.i. track on two different tracks? You are on the right path. The Thru connection on a direct box is designed to do exactly what you described: it allows the source signal to continue on to another device. In your case, it’s the input of a guitar amp. The recording will then have two components, the direct sound from the XLR jack straight into the console and the sound from a mic in front of the amp. Many people use this exact arrangement when playing live and/or recording. It’s especially powerful when recording guitar, bass, and even keyboards because you get a clean copy of the instrument signal that you can process later with an amp simulator or effects if you don’t like the sound of the mic on the amp or just need the tone to be different. Since you’ll have the guitar effectively connected to two different devices that are plugged into AC wall current (your mixer and your amp) there is potential for a ground loop to occur if the two devices are plugged into different electrical circuits. Most direct boxes will have a ‘ground’ switch that allows you to flip the polarity and eliminate the hum. Also, be safe and make sure that both devices use grounded 3-prong power cables and are plugged into grounded AC power service. I want to connect the unbalanced aux send (impedance 120 ohms, max level output +22 dBu) of my mixer to a wall-mounted powered speaker, with a balanced input, about 35 meters away. Is there likely to be any hum/buzz/interference? If there is, can it be fixed with a passive DI box? I use backing tracks played from a tablet in live situations. The problem I often have is getting enough volume to match my playing and singing. Right now I am going through RCA jacks into the tape/cd channel . Will a Di box help me here? I understand the balanced input is is usually preamped so maybe this will help? If so, passive or active? A standard direct box, typically used for guitar or bass, is not likely to be the answer. As for the tape/cd channel, the output of the tablet is usually meant for headphones, so there may not be enough level there for the mixing console. First try that same tablet output connected to a normal channel on your mixer and see if there is more level available. i’ve find it very very usefull. A very useful and detail post! I just like it so much! It took me so long time to find a similar post like this. I am so glad that I finally got one!! Thank you so much for your sharing!! Keep updating !! I am looking forward to more awesome post like this!! So, say you have a strat and a Les Paul, both with passive pickups and I want to plug them directly in a mixer or into a audio interface mic input and use it’s preamp. Does that mean I need an active DI or a passive DI or would either work? Thanks in advance. This is driving me insane and it seems the answer does not exist on the entire internet. Sorry for the slow reply!!! We had a technical issue blocking comments from getting delivered to us properly. Thanks for your question. Yes, you need a DI, and either an active or a passive would work just fine. If you’re just interested in getting the guitars connected, a passive DI will do the trick and will generally cost less. If you’re interested in more subtle tonal variations, you should take a look at active DIs as well. But if you’re just talking about getting the signal to be the right type, any DI will do the job for you. Thanks again for your patience!